Another GEO TLD .AMSTERDAM is about to be released to the Internet. 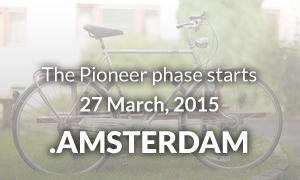 The Pioneer phase starts on Friday 27 March, 2015. Before the commencement of wider registration, Amsterdam’s own domain will be available for registration to up to a hundred pioneers affiliated with the city from 27 March to 31 August 2015. The pioneers will include organisations and people that wish to demonstrate their special ties with the Dutch capital. Pioneers will be allowed to start using their .AMSTERDAM domain names immediately. Brands, governments, businesses or people who have special ties with the city will be granted priority in domain registration. Following successful examples of .BERLIN, .LONDON or .NEWYORK, the launch of .AMSTERDAM is a worldwide trend opening up the geo-digital namespace to broaden the scope of economic growth fueled by the Internet. Based on other cities’ experience, it is expected that the domain will attract the creative industry, start-ups and e-commerce, consequently leading to intensive use of the .AMSTERDAM extension. The next phase will commence on 1 September; anyone will be able to register a name under .AMSTERDAM domain on a first-come, first-served basis. If you have special ties with the city of Amsterdam or think about opening a business there, consider registering a locally-oriented domain name under .AMSTERDAM extension. For other domains, please feel free to browse through a wide range of domains available worldwide using our search tool. Just enter the domain name you are interested in to check if it is available. If you need help, do not hesitate to contact our Support Team at support@web-solutions.eu.